Very occasionally you pick up a book, start to read it and instantly know you’re discovering something very special, something you have a feeling will be big…huge even. You know people will start to talk about it, word will get round, the issues will be debated. Goodbye for Now is such a novel. A contemporary love story for our technological age but, at its heart, the timeless issues of love, death and grief. Sam Elling is a computer programmer who is sacked from his job at an online dating company for creating such a successful programme that users find their perfect match too quickly. A happy result of the programme is he finds love himself in the form of Meredith Maxwell. When Meredith’s grandmother dies, Sam tries to aid the grieving process by inventing a computer algorithm, using previous emails and video chats, to replicate their conversations. He has found a way to help people through their grief and, once Meredith gains comfort from being able to ‘talk’ to her grandmother again, they decide to share this technology with others, creating a business, RePose. But does RePose offer help in the grieving process or does it just delay and interfere with the normal emotions of the bereaved? It all sounds too far-fetched, doesn’t it, but the author, Laurie Frankel, explains the technology in such a straightforward way that it all seems very plausible. And why not? We have phones which can speak to us and answer our questions and, only recently, the world watched Freddie Mercury, on huge video screens, interact with thousands of people at the Olympic closing ceremony. What if the technology was there to interpret texts, chats, emails and synch them in such a way that it would appear ‘real’ after death? Would we use it? I lost my own father last year and, although I have been sad, I have coped with his death quite well, I think. However I know my mother, after 50 years of marriage, desperately misses him and would just love to have a normal conversation with him again. People cope with their grief by looking at old photos, listening to shared music, reading old letters. In this book, Laurie Frankel, who writes with humour and great tenderness, with an amazing talent for dialogue, gives us much food for thought on what are the consequences of taking social networking to another level. The film rights for this book have already been snapped up and I can see why as it is as gripping and emotionally-charged as One Day by David Nicholls. It is published today, 16 August, in the UK and I predict it will be climbing the best-seller charts very quickly. 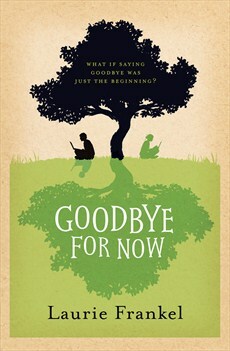 ‘Goodbye for Now’ is published by Headline Review, who sent me this copy to review. For me the grieving process involves letting go so I don't think I'd use a technology like the one in the book. Sounds like an interesting book though. I tend to agree, Janet, the idea of keeping someone's memory alive would seem to delay the healing process. It's clever how all this is tackled in the novel: the message for me was that no matter how you try and prolong a memory, you can't change the fact that grief has to take its course. I hope you like it. I can't speak for everyone but, for me, it was a great read. Sounds an intriguing premise for a book. I'm glad to read your further comment, though, that the message in the book is ultimately that you can't change the fact that grief happens. I've met people who avoided their grief by self-medicating (some for years or even decades). Once they come out of that, the shock is that they have to deal with the death of their loved one (babies, in my 'line of work') so many years hence. In that regard, such a technology would confuse the issue… but still, this is fiction! And it sounds really interesting. There are some very clever storytellers out there. That's what pleased me about the book, Kirrily. I wasn't sure what line the author would take but, without giving anything away, I think the message was very clear. It seems such an unusual premise for a book but clearly works.. Another one for the Kindle! I was't sure when I read the back cover, but it was brilliant and so well-written. That sounds a good 'un. Delving into grief is always gonna bring up arguments about beliefs about what's right etc – some people might need their grief delayed – who knows! But it sounds really interesting anyway. '5 People You Meet In Heaven' was an interesting idea too – can't remember the author but I read that a year or so ago and gives you food for thought. I like things like this. My mum has told me that she has a copy of '5 People you meet in heaven' so I'll borrow that from her when I next see her. Ha! That sounds like such an original premise for a book! I like the fact that it is an old-fashioned love story and deals with normal human emotions yet is up-to-date with how we communicate with each other now. Best book I've read in ages. Bit of a weepy too. Sounds intriguing. I read a book recently about the increasing importance of technology taking over our lives and it seems there is much material to be used. Look out for Timeline by David Wailing. Short but intense.